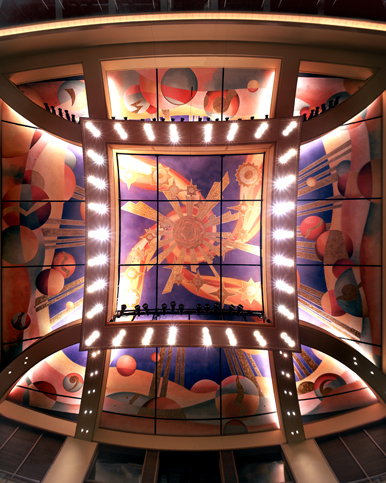 Design Concultant:	Piatt Associates, inc.
Piatt Associates created a monumental work of art for the ceiling at the new 907-seat Belding Theater at the Bushnell in Hartford. The design was conceived as an expression of the synergistic energy of a great orchestra analogous to the mysteries underlying the creative instinct and the moment of cosmic creation. The work is arranged on multiple overlapping and curved ceiling panels with an overall dimension eighty feet square. The work was executed in collaboration with Evergreene Painting Studios and Wilson Butler Architects, the theater architect.